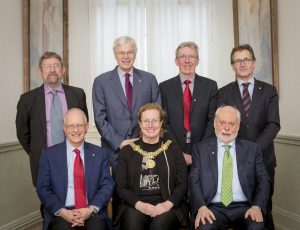 We’re happy to say that six Nobel Prize winners accepted our invitation and honoured Uppsala University by giving the traditional lectures here on St Lucia’s Day (Tuesday). Full houses in the lecture halls in the morning, and festive spirits at lunch at the Castle. This tradition dates back to 1902, when we first had a Nobel laureate visiting us. Chemistry laureate Ben Feringa comes from the University of Groningen, which of course we cooperate with closely in the U4 Group and the Guild. The President of the Board of Groningen University, Sibrand Poppema, and Rector Magnificus Elmer Sterken accompanied their laureate to Uppsala and ended the day by attending a traditional St Lucia’s Day student party (‘Lussegasque’) with Anders. A great success! 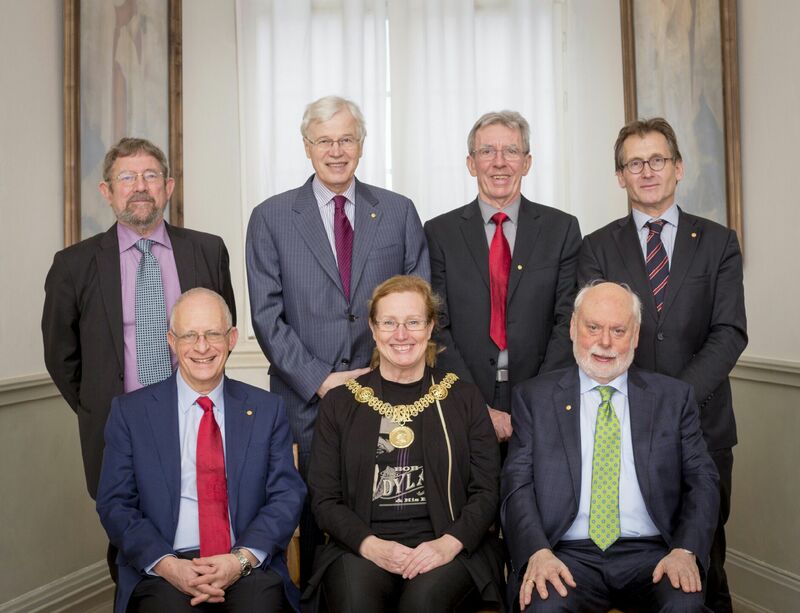 More Christmas events: We’ve already blogged about the University Board’s last meeting this year, followed by Christmas lunch, in a separate post. 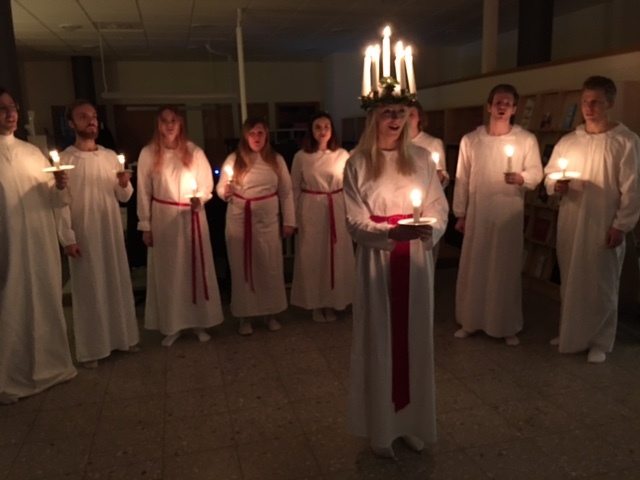 On Monday the Vice-Chancellor’s Management Council looked back at the past year and then had Christmas lunch together, the Disciplinary Domain of Medicine and Pharmacy had its traditional Christmas party on Wednesday and on Thursday the staff at Campus Gotland had their Christmas party. St Lucia’s Day fika at the Uppsala University Student Union is another of our traditions. And Eva spoke at the universities’ Christmas service in Uppsala Cathedral on 15 December. 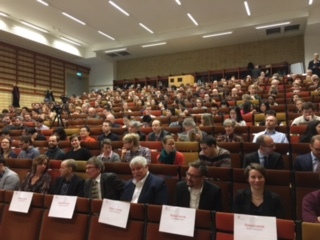 This duty alternates between the vice-chancellors of Uppsala University and the Swedish University of Agricultural Sciences, and this year it was our turn. 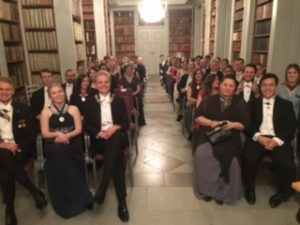 The week ended with an awards ceremony for students active in the student unions and nations, at which Anders gave a speech thanking all the students for their commitment and presented well-deserved diplomas. But we have found time for other things this week too. Alexander von Gabain, who is Deputy Vice-Chancellor for Innovation and Commercial Outreach at Karolinska Institutet, visited us and met representatives of our innovation system. We see good potential for enhanced cooperation between Uppsala and Karolinska on support for innovations. Eva opened the Association of Swedish Higher Education conference on “Admission to Higher Education” with a presentation on broader recruitment, newcomers in Sweden, validation and lifelong learning. The conference examined issues relating to admission to higher education from various angles. Inquiry chair Jörgen Tholin briefed the participants on the thoughts and ideas of the Higher Education Admissions Inquiry. The current regulations for admissions to higher education are difficult to understand and unpredictable and we have great hopes that this will be remedied by the inquiry, which will deliver its report in March 2017.